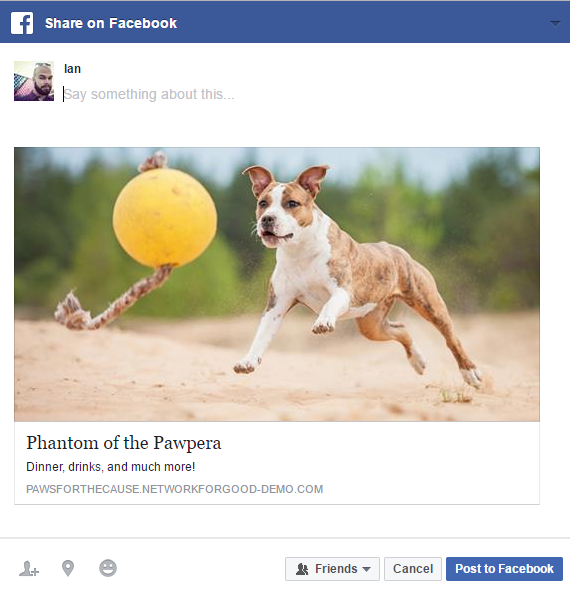 Your next new donors are out there - on social media! That's why we've made it simple to share your Network for Good fundraising page with all your connections across platforms. Each page you create has social media icons floating on the left hand side so sharing is a snap. Click the button for the platform where you'd like to share the page - you can choose from Facebook, Twitter, LinkedIn, Google+, or good old fashioned email. If you're already logged into Facebook, for example, a post will automatically generate for you to edit and share with your selected friend group. If you're not yet logged in, the page will ask you to enter your username and password before continuing. Simply edit your post or email so that it suits you, and share away! New to Social Sharing: You can now share directly inside of your dashboard! Looking for an easy way to share your campaign directly from the administrator side? It's here! 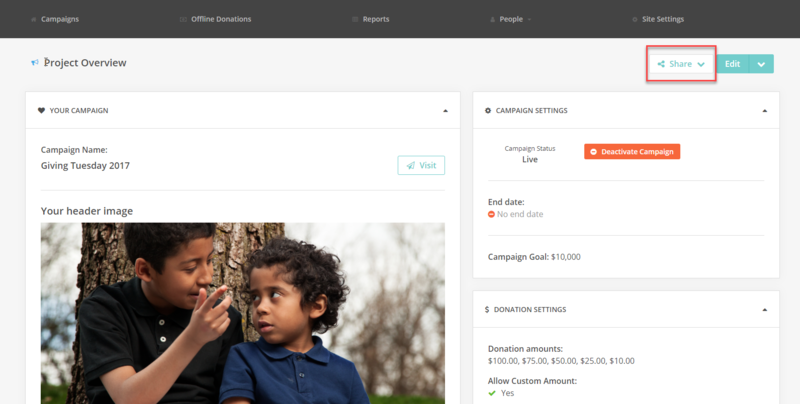 You can now quickly share your campaign from within the Fundraising Pages dashboard. Simply find the Campaign that you'd like to share and follow the Dashboard button. From the Project Overview page, just click the Share button. 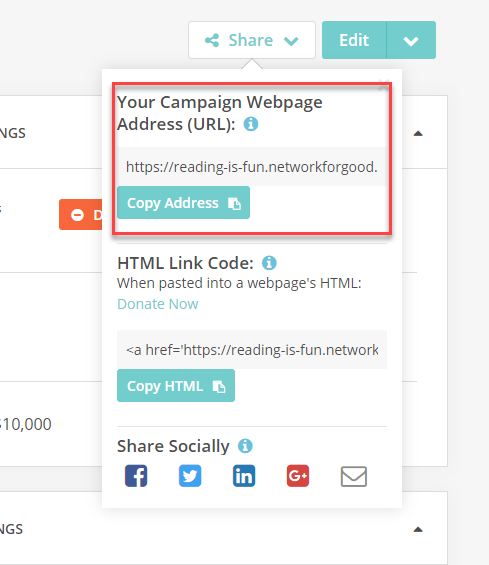 This will give you three options to share your campaign! First, you are able to quickly copy the URL so that you can add it to your website. Either click on the URL itself or use the Copy Address button to copy it to your clipboard. Want code instead? 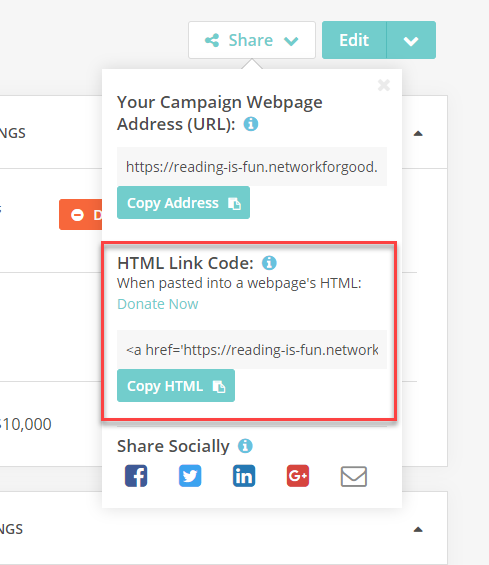 Click the Copy HTML button to grab the code for some pre-formatted, hyperlinked text. 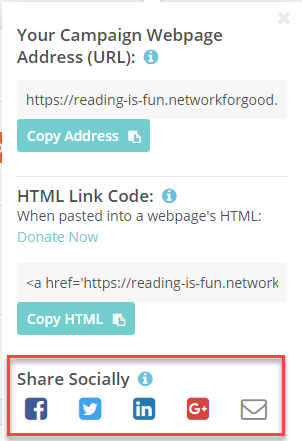 Check out Adding a Donation Page to Your Website for more about hyperlinking & sharing your page with the world! Lastly, you've got social media sharing built right in. These work exactly the same as the front-facing buttons on the donation page itself...give it a try! Happy [now more social] fundraising! How can I add my campaign to my website? How do I share my campaign offline? What's an Everyday Giving Page? How do I set goals and campaign end dates? How do I change the donor scroll? How do I update my donor's email address?